Quick Question: Why Can't I Stop Thinking About Volvo Rebadging a Camaro in the 1970s? Like many people, there’s a part of my brain that unconsciously stores visually similar things. That’s why we can see faces in bathroom sinks and also why I’ve always thought that the 1969-1975 Volvo 164 looks strangely similar to the 1972 Chevrolet Camaro. I kept thinking about it this morning, so instead of taking over my day, let’s just purge it by bringing it all out into the open and wondering what if Volvo re-badged a Camaro in the 1970s? Let’s get the visual congruence out of the way first: I think both cars, as wildly different as they are, have remarkably similar faces. They both have a large, prominent central grille, jutting forward of the rest of the body, like the proud mouth of a fresh-water bass. They also both have prominent twin, round light units—on the Volvo, sometimes the smaller, inner lamp is replaced with a round grille, and the Camaro uses the smaller inner round lamps for its turn indicators, but the visual similarity is still there. They both also have a split bumper design, and the general arrangement of the fender pontoons, hood bulges and creases, and overall look of the two front ends are like two takes on the same theme: the Volvo’s more upright proportions are more fitting of the family car it was, and the Chevy’s more wide and low proportions are well-suited to its sporty, muscle-car character. To me, they always looked like the sedan and sport coupe version of the same basic car. 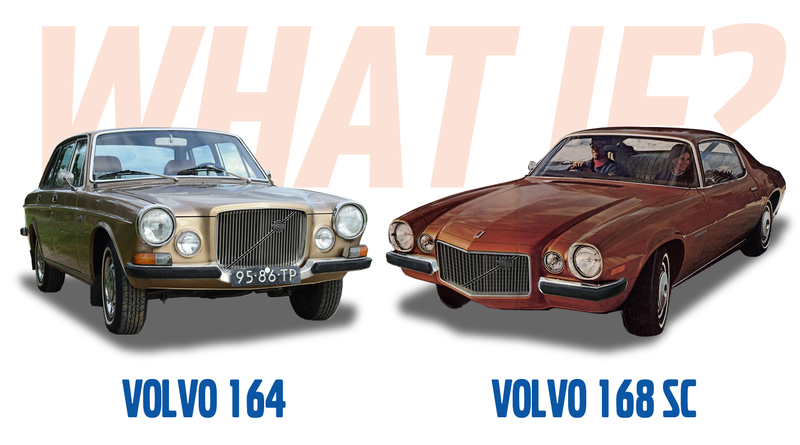 So, what if Volvo agreed, way back then? What if they decided that their lone sporty car offering, the P1800, needed a more muscular, bigger brother? Camaro production in 1972 was a little troubled, as GM was dealing with a strike at their Norwood, OH plant; maybe this would have been the motivation GM needed to get the Swedes involved. The six-month work stoppage meant Chevy had to scrap thousands of partially-built cars, since they’d no longer meet 1973 regulations. What if they could have sent those to Sweden, where Volvo would have uprated them with better bumpers and seat belts to meet Volvo standards, anyway? That could have been how the whole thing started! Maybe the 168 SC would never be sold in the U.S., but rather in Scandinavia and Europe? I know Swedes love American muscle cars, perhaps this would have been a way to let Volvo get a piece of that market? Okay. Now this goofy idea is out of my head, and hopefully in yours. Enjoy that.